Hello and welcome to my blog today, thank you for stopping by. I have a new Christmas card to share with you and it has a action wobble on it. I colored my images in Distressed Inks and covered it all with Frantage in Sahbby White. Bigsnow flurries for Edwin to get through. 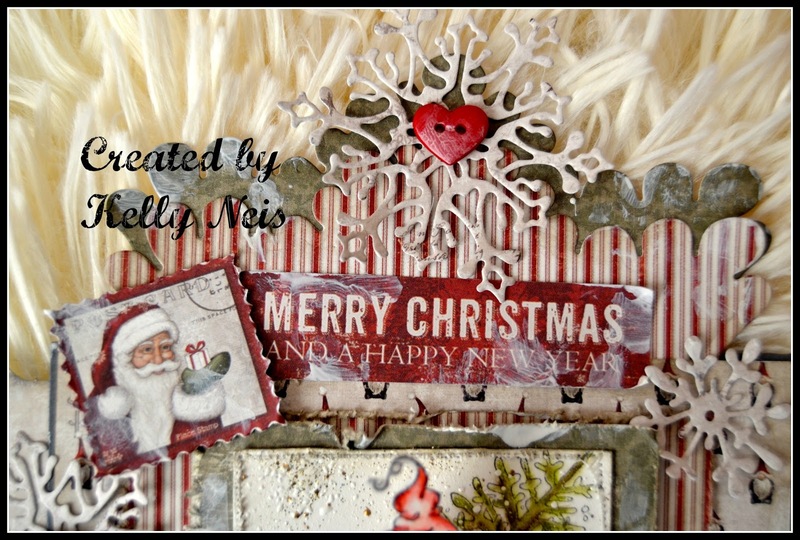 Here is the bottom of the card using Magnolia doohickey snowflakes and some buttons, lace, ribbon and bells. Edwin is riding high on a wobble so when he goes over the hills he is shaking. 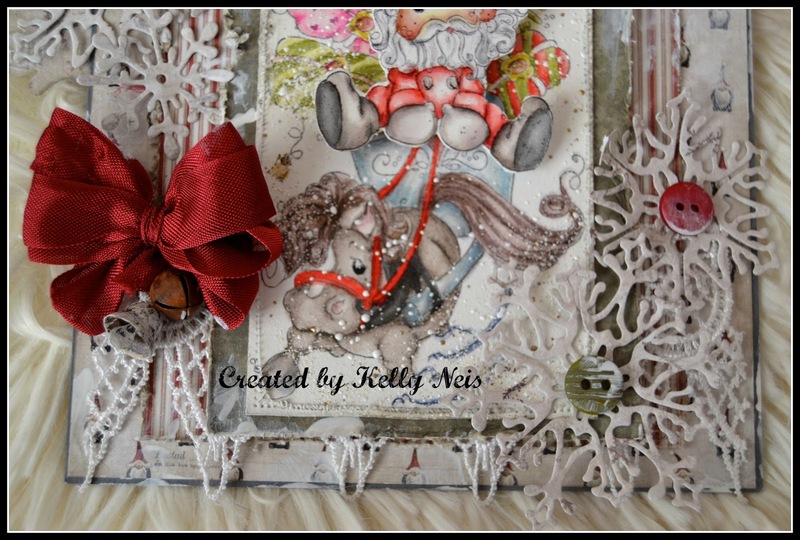 The top of the card has 2 Magnolia doohickey envelope dies and snippets from the Maja Paper pad I used. Awesome paper, almost scared to use them they, look so pretty. Here is a shot at the wobble, hard to get this photo because I had to cut it down as Edwin is so small. I glued it on and he moves freely on the card. Very shortly I have some fun coming to my blog for you so keep checking back! Oh what fun it is to look at your new card. Love this beauty!! So many luscious die cuts, coloring and details!!! You did a fantastic job creating this work of art! I'll be watching your blog for some more fun!!! Gorgeous! Gorgeous! I love the way it turned out! 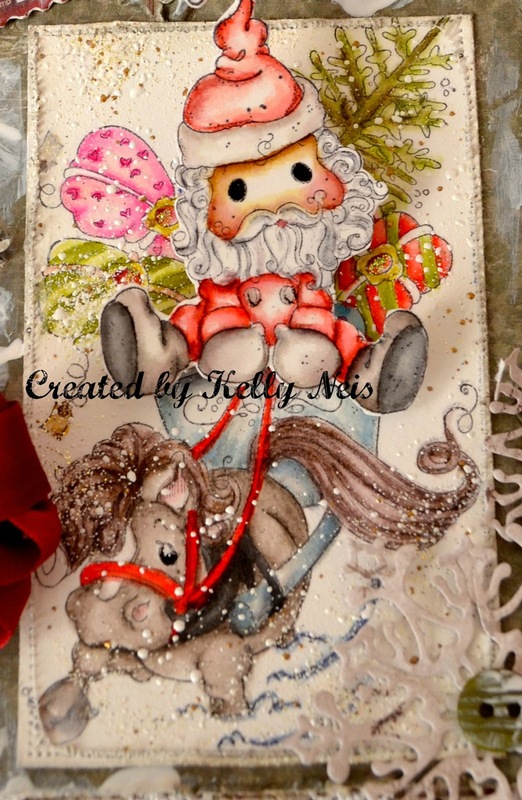 Lovely coloring and embellishing. Hello Kelly, oh what fun it is to ride with Edwin! I love your card, spectacular mise en scène here! gorgeous ! cant't wait to come back for more fun! Hugs. Oh my goodness, how precious is this!!!! Just beautiful! This is so beautiful, so many stunning touches. Thank you so much for sharing your lovely creation with us at Divas by Design.. This is so pretty Kel. I love the image and your brilliant colouring and all those gorgeous layers. 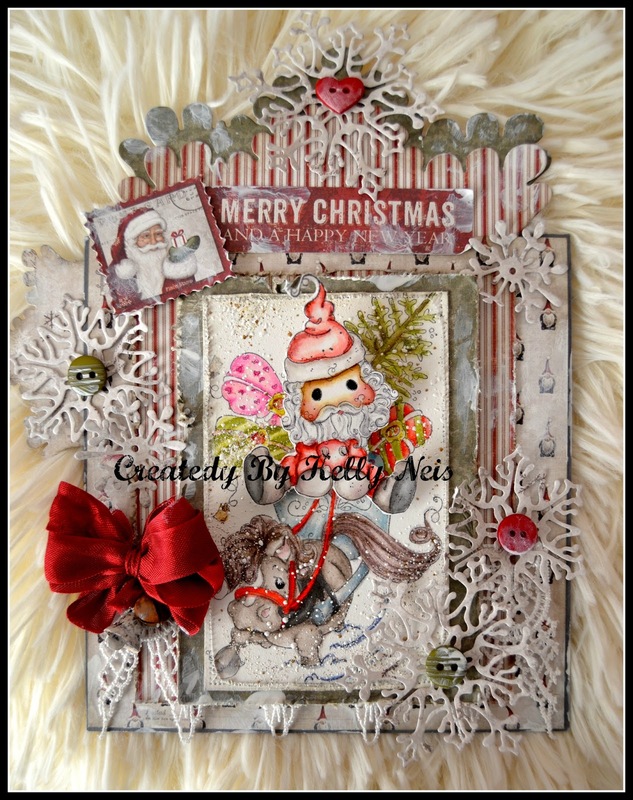 Pretty snowflakes and great use of Frantage.